In celebration of the opening Arby's second New York City restaurant this week, the location will be serving up a limited quantity of their elusive Venison Sandwiches. 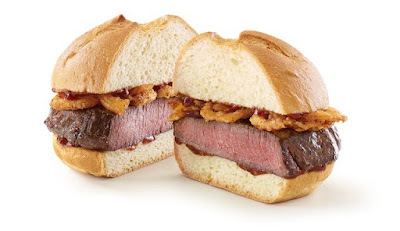 The sandwich, which consists of a thick-cut venison steak, crispy onions, and juniper berry sauce on a toasted specialty roll, will only be available at the Arby's at 32 East 23rd Street starting Saturday, March 4, 2017. Given that the sandwich has previously been confined to more heavy deer hunting locales like Wisconsin and Minnesota, this will be the first time it's available in New York. It's sold out rather quickly in its previous visits and NYC is rather populous so, if you're dead set on getting one, you might want to line up early.